Tribes Service: "Julie was brilliant and very patient as we wrestled with choices for our holiday. She was able to help us design a perfect holiday that met all of our hopes (exceeded them actually!)" Social & Environmental Responsibility: "Excellent"
Fumba was another step up again in terms of quality, although we did start to lose the 'small friendly lodge' vibe we had enjoyed at Shooting Star. However, the candlelit meals in various locations were really amazing - as were the stars. Shooting Star was lovely - friendly, laid back, beautiful accommodation (nicer than Fumba actually! ), good food (not fantastic), great location, nice bar area. 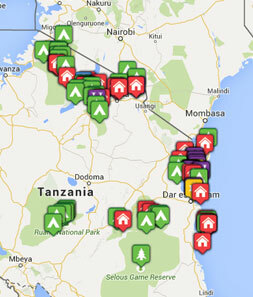 Start planning your tailor-made holiday to Tanzania. Tell us what you want, and we will tailor make your perfect trip.  Flight time: Flights from UK to Tanzania take about 9 hours direct or 10-11 with a brief stopover en route if from Europe.  Language: Kiswahili and English are Tanzania's official languages. Although most people in the cities speak some English, a few phrases of Kiswahili are useful in more rural areas.  Visas: Most nationalities require a Tanzania visa, obtainable from the High Commission in London (or on arrival into International Airport.  Health: Most nationalities require a Tanzania visa, obtainable from the High Commission in London (or on arrival into International Airport.